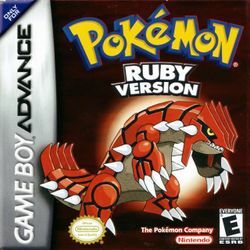 Pokémon Ruby is (together with Pokémon Sapphire) the first Pokémon game for the Game Boy Advance. It features greatly enhanced graphics, 135 more Pokémon to catch and train, and an entirely new game world to play in. It was later followed by Pokémon Emerald, an enhanced third version featuring improved graphics and an adjusted main storyline. The game is set in the land of Hoenn where you (the main character) embark on a brand new adventure and aim to become the best Pokémon trainer ever. The goal of all trainers is to defeat all eight of the Gym Leaders and earn the eight badges from each leader. Only then you will have access to the Elite Four, where you can test your skills as a Pokémon trainer. There are also many objectives standing in your way of fulfilling your goal, including the villains, Team Aqua or Magma (Aqua in Sapphire, Magma in Ruby) who attempt to destroy the world of Pokémon, however, your objective is to stop them and be the hero of the Pokémon world. At times, like all Pokémon games, you will encounter wild Pokémon (which you can catch), and be battled by other trainers, however, if you train your Pokémon well, you should be able to keep ahead. This page was last edited on 23 August 2015, at 23:25. This page has been accessed 424,722 times.